This weekend has been really wonderful. I drove on Saturday morning to visit my sister Emma and a friend Gems, in the lovely village of Mobberley in Cheshire. 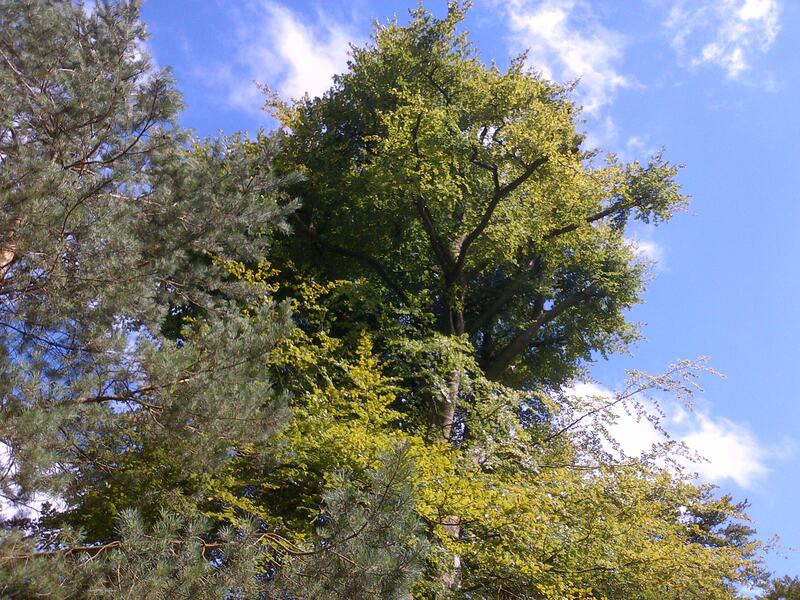 After a refreshing cup of tea we decided to head over to Alderley Edge for a walk in the sunshine. 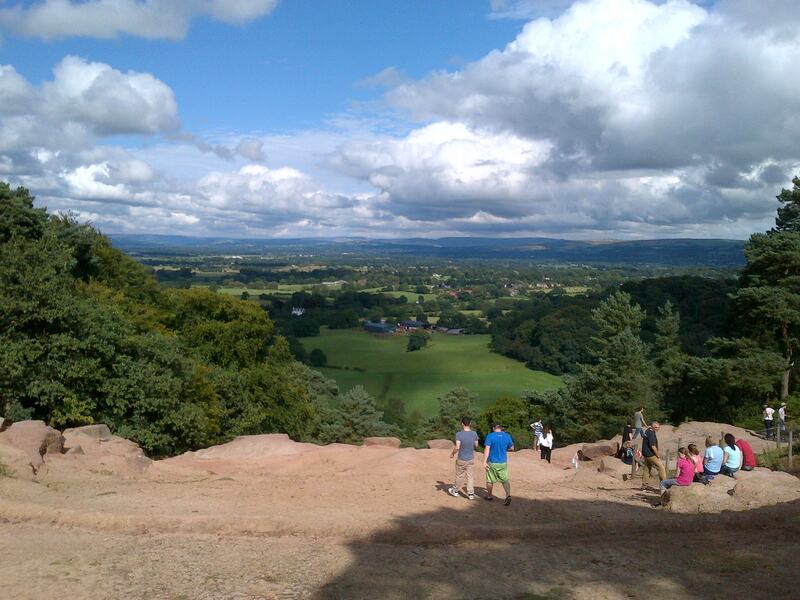 http://www.nationaltrust.org.uk/alderley-edge. It was lovely walking through all the trees and we sat down on the stone peak which has the most beautiful views over the Cheshire Plain to the Peak District. It was so peaceful just sat in the sunshine and there were quite a few like minded people scattered around, I could have sat there for hours. After, we went for a another cup of tea at the Wizard tea Rooms where I had a very tasty apple and plum pie. Yesterday (Sunday) I went over to Stockport Handmade and Producers Market which was being held in the Old Indoor Market Hall on the 3rd Sunday of every month. Even if you don’t always get the profit you are aiming for it is the people you meet that can make the difference. And now it is back to reality and the working week! The last time I went to visit Ordsall was in 2009 just before they closed it for refurbishment; it opened again May last year (2011). This Garden party was held for the first time last year and so this year I decided to apply for a stall and luckily got a place. Typically, when I woke up in the morning it was tipping it down with rain. I swear I have a weather curse when it comes to attending fairs. My first ever craft fair back in February was the one day it snowed, and nearly every other one so far this year, it has rained, but I was not to be put off. When I got there at 11am it was spitting and really windy but we all set up regardless, unsure of whether anyone would turn up. As we were getting our stalls ready, I heard the strange sound of bleating sheep coming from somewhere, not the normal sounds of Salford. They were setting up a pen with sheep, goats, pigs, chickens and ducks for kids to come and see and handle so hopefully with all the different attractions it would be good. 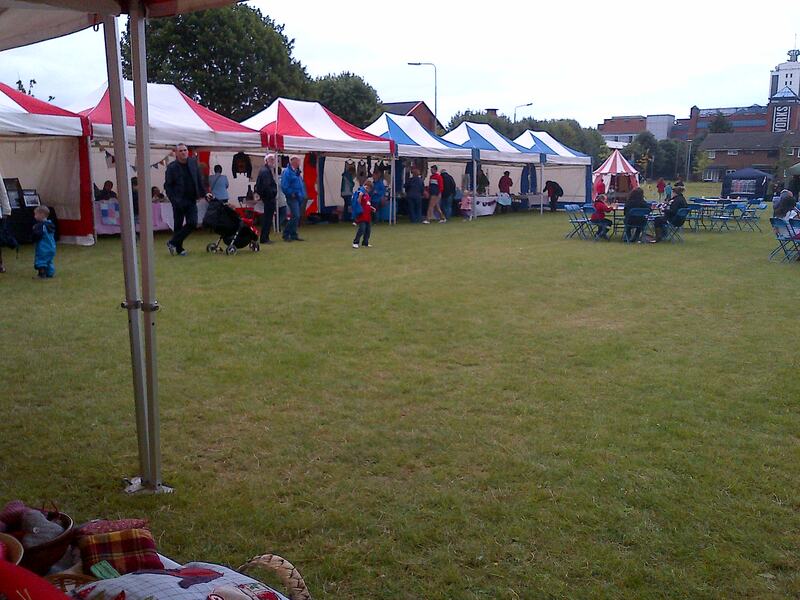 There were about 10 craft stalls selling a range of products from glass to photographs and knitted items. There was a great array of different crafts and no two were the same so as the visitors walked around they would have a brilliant choice of products to buy. 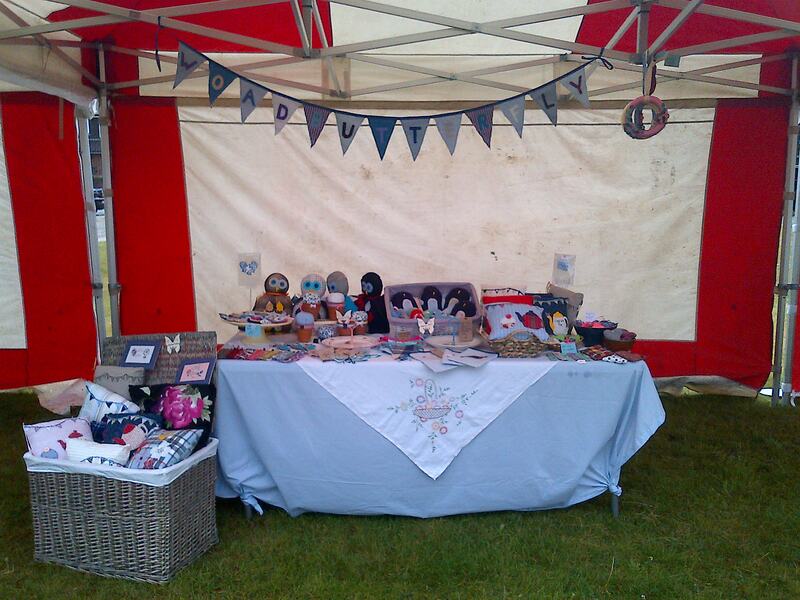 I was really happy with my stall and I think it was my best lay out to date. I recently brought a large wicker basket to keep my fabric in and decided that I would bring it to put my cushions in and it worked brilliantly. It got them off the table where they normally take up a lot of room. The fair opened at 12pm and the first few people trickled in. As the day got going a lot of people came through and it turned into a really great day. The weather still wasn’t brilliant and it was freezing stood still but it was worth it. It was great to talk to lots of different people and I got loads of lovely comments about my work. 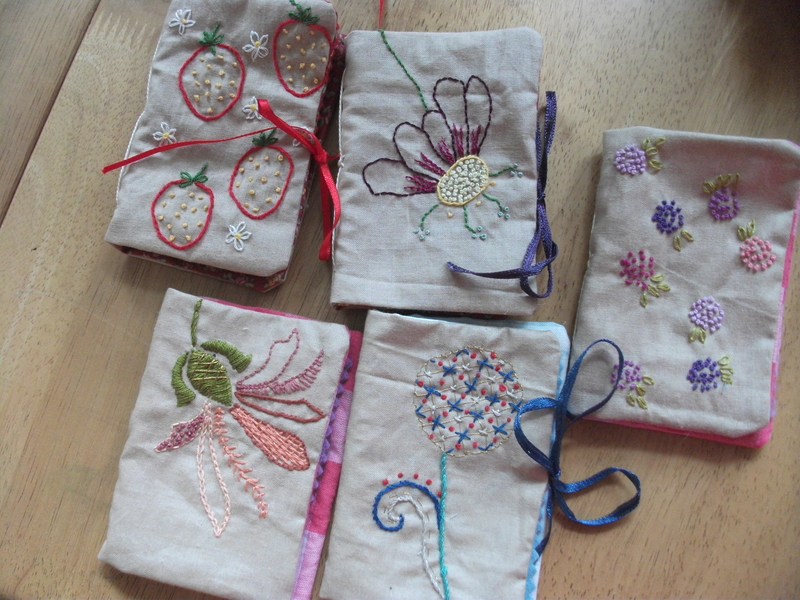 The first thing to go was one of my embroidered needle cases which I had only finished the day before. My owl doorstops were also a great seller. There were people working for the hall dressed in Tudor costume wandering about with buckets collecting donations towards the hall, people selling strawberries and cream, homemade chilli and a tent showing you how to make little wands with willow. Inside the hall was a brass band which we could hear from outside and lots of events for the children to enjoy. As expected the sun came out as we were packing up but it finished off an enjoyable day rather nicely. A little bit of history for you. 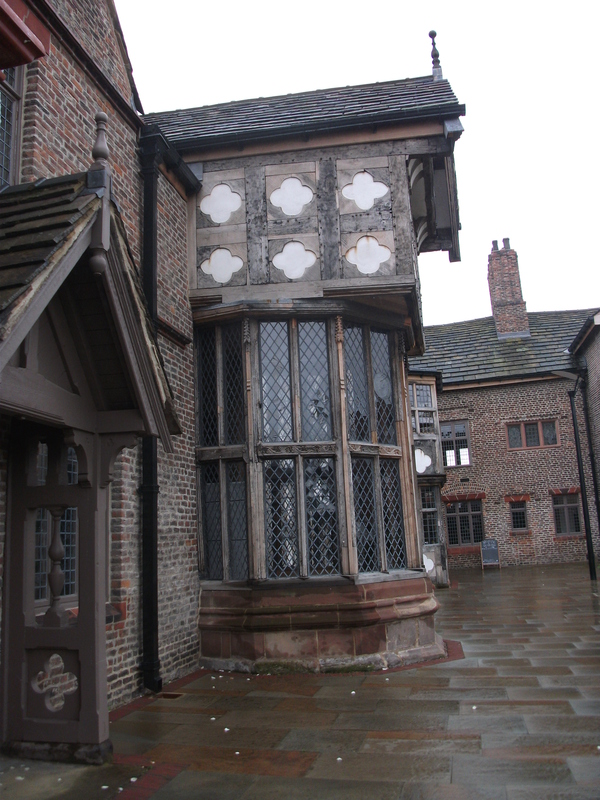 Ordsall Hall is a Grade 1 listed historic house in Salford, Lancashire. 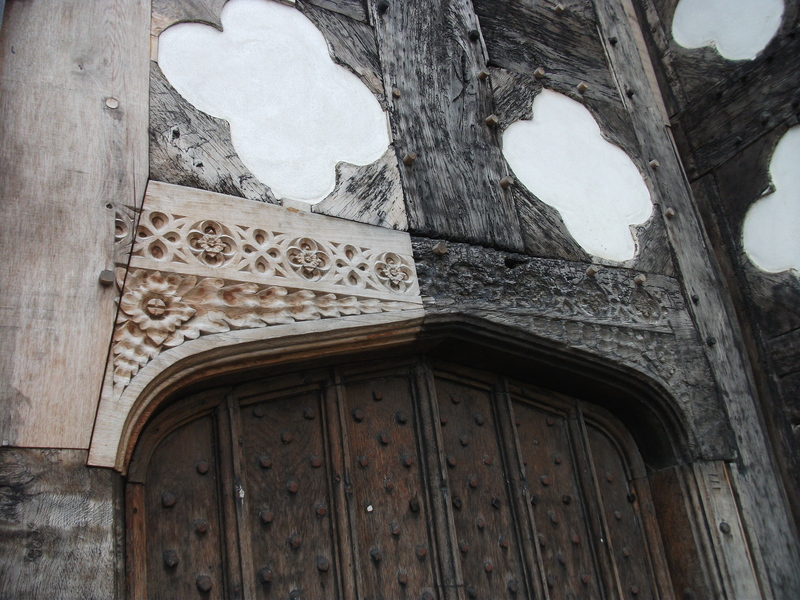 It dates back over 820 years, the oldest parts still surviving today date back to around the 15th century. It is one of only 8 comparable grade 1 listed timber framed buildings in Lancashire and is one of the finest records of construction techniques and materials of its kind in the North West of England. Today I went back to get a few more photos for this blog and luckily I was the only visitor there and got a guided tour of the house by one of the fabulous volunteers. It was truly fascinating and you can even go up into the roof space which you couldn’t before and see all the wood work and timber frame construction. It was first the family seat of the Radclyffe family for over 300 years and when they sold it in 1662 it has since been a working men’s club and a church hall among other things. The building was brought by Salford City Council in 1959, and opened to the public in 1972, as a local museum. They have done an amazing job since I was last at the hall and hopefully they get lots more visitors through the doors, I definitely recommend it and it is free entry. 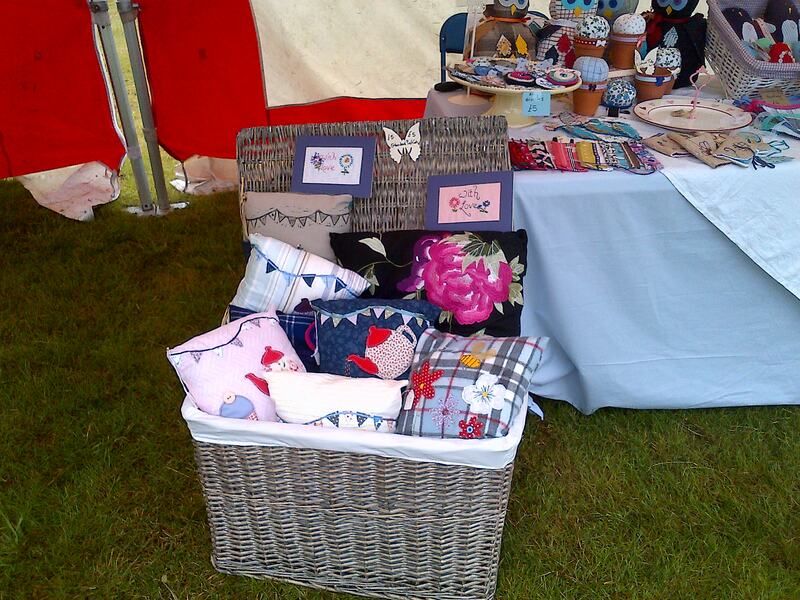 Yesterday I attended a craft fair at the Last Drop Village near Bolton. It is a lovely venue, a collection of Georgian farm building which have been made into a hotel and spa with a tea shop and gallery. My lovely sister Emma came with me to help me out though I think she spent a lot of her time in a queue getting cups of tea. I met a lot of really lovely fellow crafters and in particular Lynn Holland who does the most lovely illustrations including her cute Doodly Birds collection. 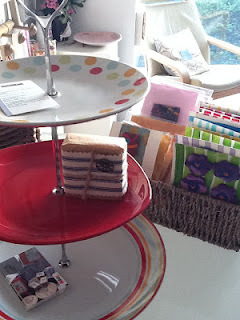 Check out her wonderful blog where she has been kind enough to include a photo of one of my cake stands that she brought off me yesterday. There is also a link to her Etsy shop, full of wonderful goodies. 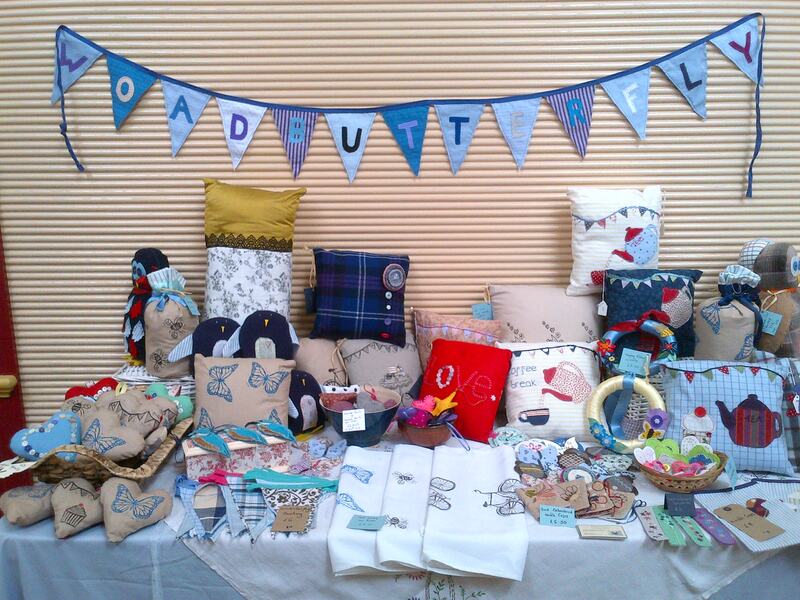 Yesterday was the best I have done at a craft fair to date. The last two were definitely more of a learning curve but were still invaluable experience. Yesterday was the first time that I got my selling hat on a got to grips with properly talking to people and interacting and not waiting for people to ask me things. I can be a very shy person but I really enjoyed bantering with customers and fellow stall holders and getting more confident and it definitely makes a huge difference to sales. Also a big tip is standing up, don’t sit down when customers come over it makes a huge difference, it is easier to interact with people if you are on eye level with them.